Cone photoreceptors undergo a daily cycle of renewal and shedding of membranous discs in their outer segments (OS), the portion responsible for light capture. These physiological processes are fundamental to maintaining photoreceptor health, and their dysfunction is associated with numerous retinal diseases. While both processes have been extensively studied in animal models and postmortem eyes, little is known about them in the living eye, in particular human. In this study, we report discovery of the optical signature associated with disc shedding using a method based on adaptive optics optical coherence tomography (AO-OCT) in conjunction with post-processing methods to track and monitor individual cone cells in 4D. The optical signature of disc shedding is characterized by an abrupt transient loss in the cone outer segment tip (COST) reflection followed by its return that is axially displaced anteriorly. Using this signature, we measured the temporal and spatial properties of shedding events in three normal subjects. Average duration of the shedding event was 8.8 ± 13.4 minutes, and average length loss of the OS was 2.1 μm (7.0% of OS length). Prevalence of cone shedding was highest in the morning (14.3%) followed by the afternoon (5.7%) and evening (4.0%), with load distributed across the imaged patch. To the best of our knowledge these are the first images of photoreceptor disc shedding in the living retina. L. Ruggiero and S. C. Finnemann, Rhythmicity of the Retinal Pigment Epithelium, Retina and Circadian Rhythms (Springer Series in Vision Research, 2014), Vol. 1. B. M. Kevany and K. Palczewski, “Phagocytosis of retinal rod and cone photoreceptors,” Physiology (Bethesda) 25(1), 8–15 (2010). C. H. Sung and J. Z. Chuang, “The cell biology of vision,” J. Cell Biol. 190(6), 953–963 (2010). A. Gal, Y. Li, D. A. Thompson, J. Weir, U. Orth, S. G. Jacobson, E. Apfelstedt-Sylla, and D. Vollrath, “Mutations in MERTK, the human orthologue of the RCS rat retinal dystrophy gene, cause retinitis pigmentosa,” Nat. Genet. 26(3), 270–271 (2000). S. van Soest, A. Westerveld, P. T. V. M. de Jong, E. M. Bleeker-Wagemakers, and A. A. B. Bergen, “Retinitis pigmentosa: Defined from a molecular point of view,” Surv. Ophthalmol. 43(4), 321–334 (1999). S. Y. Kim, “Retinal phagocytes in age-related macular degeneration,” Macrophage (Houst) 2(1), e698 (2015). C. C. Yu, E. F. Nandrot, Y. Dun, and S. C. Finnemann, “Dietary antioxidants prevent age-related retinal pigment epithelium actin damage and blindness in mice lacking αvβ5 integrin,” Free Radic. Biol. Med. 52(3), 660–670 (2012). S. Zacchigna, H. Oh, M. Wilsch-Bräuninger, E. Missol-Kolka, J. Jászai, S. Jansen, N. Tanimoto, F. Tonagel, M. Seeliger, W. B. Huttner, D. Corbeil, M. Dewerchin, S. Vinckier, L. Moons, and P. Carmeliet, “Loss of the Cholesterol-Binding Protein Prominin-1/CD133 Causes Disk Dysmorphogenesis and Photoreceptor Degeneration,” J. Neurosci. 29(7), 2297–2308 (2009). Z. Yang, Y. Chen, C. Lillo, J. Chien, Z. Yu, M. Michaelides, M. Klein, K. A. Howes, Y. Li, Y. Kaminoh, H. Chen, C. Zhao, Y. Chen, Y. T. Al-Sheikh, G. Karan, D. Corbeil, P. Escher, S. Kamaya, C. Li, S. Johnson, J. M. Frederick, Y. Zhao, C. Wang, D. J. Cameron, W. B. Huttner, D. F. Schorderet, F. L. Munier, A. T. Moore, D. G. Birch, W. Baehr, D. M. Hunt, D. S. Williams, and K. Zhang, “Mutant prominin 1 found in patients with macular degeneration disrupts photoreceptor disk morphogenesis in mice,” J. Clin. Invest. 118(8), 2908–2916 (2008). M. Koike, M. Shibata, Y. Ohsawa, H. Nakanishi, T. Koga, S. Kametaka, S. Waguri, T. Momoi, E. Kominami, C. Peters, K. Figura, P. Saftig, and Y. Uchiyama, “Involvement of two different cell death pathways in retinal atrophy of cathepsin D-deficient mice,” Mol. Cell. Neurosci. 22(2), 146–161 (2003). R. W. Young and D. Bok, “Participation of the retinal pigment epithelium in the rod outer segment renewal process,” J. Cell Biol. 42(2), 392–403 (1969). R. W. Young, “The renewal of photoreceptor cell outer segments,” J. Cell Biol. 33(1), 61–72 (1967). D. H. Anderson, S. K. Fisher, and R. H. Steinberg, “Mammalian cones: disc shedding, phagocytosis, and renewal,” Invest. Ophthalmol. Vis. Sci. 17(2), 117–133 (1978). R. H. Steinberg, I. Wood, and M. J. Hogan, “Pigment epithelial ensheathment and phagocytosis of extrafoveal cones in human retina,” Philos. Trans. R. Soc. Lond. B Biol. Sci. 277(958), 459–471 (1977). D. H. Anderson and S. K. Fisher, “The photoreceptors of diurnal squirrels: outer segment structure, disc shedding, and protein renewal,” J. Ultrastruct. Res. 55(1), 119–141 (1976). D. H. Anderson and S. K. Fisher, “Disc shedding in rodlike and conelike photoreceptors of tree squirrels,” Science 187(4180), 953–955 (1975). M. Pircher, J. S. Kroisamer, F. Felberer, H. Sattmann, E. Götzinger, and C. K. Hitzenberger, “Temporal changes of human cone photoreceptors observed in vivo with SLO/OCT,” Biomed. Opt. Express 2(1), 100–112 (2011). 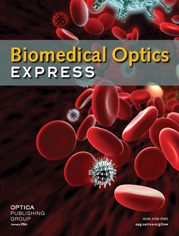 R. S. Jonnal, O. P. Kocaoglu, Q. Wang, S. Lee, and D. T. Miller, “Phase-sensitive imaging of the outer retina using optical coherence tomography and adaptive optics,” Biomed. Opt. Express 3(1), 104–124 (2012). R. F. Cooper, A. M. Dubis, A. Pavaskar, J. Rha, A. Dubra, and J. Carroll, “Spatial and temporal variation of rod photoreceptor reflectance in the human retina,” Biomed. Opt. Express 2(9), 2577–2589 (2011). A. Pallikaris, D. R. Williams, and H. Hofer, “The reflectance of single cones in the living human eye,” Invest. Ophthalmol. Vis. Sci. 44(10), 4580–4592 (2003). B. A. Shafer, J. E. Kriske, O. P. Kocaoglu, T. L. Turner, Z. Liu, J. J. Lee, and D. T. Miller, “Adaptive-Optics Optical Coherence Tomography Processing Using a Graphics Processing Unit,” Conf. Proc. IEEE Eng. Med. Biol. Soc. 2014, 3877–3880 (2014). ANSI Z136, “Safe use of lasers,” Laser Institute of America (2014). K. P. Wright, A. W. McHill, B. R. Birks, B. R. Griffin, T. Rusterholz, and E. D. Chinoy, “Entrainment of the human circadian clock to the natural light-dark cycle,” Curr. Biol. 23(16), 1554–1558 (2013). J. F. Duffy and K. P. Wright., “Entrainment of the human circadian system by light,” J. Biol. Rhythms 20(4), 326–338 (2005). C. Gronfier, K. P. Wright, R. E. Kronauer, and C. A. Czeisler, “Entrainment of the human circadian pacemaker to longer-than-24-h days,” Proc. Natl. Acad. Sci. U.S.A. 104(21), 9081–9086 (2007). B. Middleton, B. M. Stone, and J. Arendt, “Human circadian phase in 12:12 h, 200: <8 lux and 1000: <8 lux light-dark cycles, without scheduled sleep or activity,” Neurosci. Lett. 329(1), 41–44 (2002). Z. Liu, O. P. Kocaoglu, T. L. Turner, and D. T. Miller, “Modal content of living human cone photoreceptors,” Biomed. Opt. Express 6(9), 3378–3404 (2015). Z. Liu, O. P. Kocaoglu, and D. T. Miller, “3D Imaging of Retinal Pigment Epithelial Cells in the Living Human Retina,” Invest. Ophthalmol. Vis. Sci. 57(9), OCT533 (2016). R. S. Jonnal, O. P. Kocaoglu, R. J. Zawadzki, Z. Liu, D. T. Miller, and J. S. Werner, “A Review of Adaptive Optics Optical Coherence Tomography: Technical Advances, Scientific Applications, and the Future,” Invest. Ophthalmol. Vis. Sci. 57(9), OCT51–OCT68 (2016). S. K. Fisher, B. A. Pfeffer, and D. H. Anderson, “Both rod and cone disc shedding are related to light onset in the cat,” Invest. Ophthalmol. Vis. Sci. 24(7), 844–856 (1983). D. H. Anderson, S. K. Fisher, P. A. Erickson, and G. A. Tabor, “Rod and cone disc shedding in the rhesus monkey retina: a quantitative study,” Exp. Eye Res. 30(5), 559–574 (1980). M. M. LaVail, “Kinetics of rod outer segment renewal in the developing mouse retina,” J. Cell Biol. 58(3), 650–661 (1973). M. M. LaVail, “Photoreceptor characteristics in congenic strains of RCS rats,” Invest. Ophthalmol. Vis. Sci. 20(5), 671–675 (1981). N. Buyukmihci and G. D. Aguirre, “Rod disc turnover in the dog,” Invest. Ophthalmol. 15(7), 579–584 (1976). G. Aguirre and L. Andrews, “Nomarski evaluation of rod outer segment renewal in a hereditary retinal degeneration. Comparison with autoradiographic evaluation,” Invest. Ophthalmol. Vis. Sci. 28(7), 1049–1058 (1987). R. W. Young, “The renewal of rod and cone outer segments in the rhesus monkey,” J. Cell Biol. 49(2), 303–318 (1971). R. W. Young, “The daily rhythm of shedding and degradation of rod and cone outer segment membranes in the chick retina,” Invest. Ophthalmol. Vis. Sci. 17(2), 105–116 (1978). W. T. O’Day and R. W. Young, “Rhythmic daily shedding of outer-segment membranes by visual cells in the goldfish,” J. Cell Biol. 76(3), 593–604 (1978). R. W. Young, “The daily rhythm of shedding and degradation of cone outer segment membranes in the lizard retina,” J. Ultrastruct. Res. 61(2), 172–185 (1977). N. F. Johnson, “Phagocytosis in the normal and ischaemic retinal pigment epithelium of the rabbit,” Exp. Eye Res. 20(2), 97–107 (1975). M. M. LaVail, “Circadian nature of rod outer segment disc shedding in the rat,” Invest. Ophthalmol. Vis. Sci. 19(4), 407–411 (1980). A. I. Goldman, P. S. Teirstein, and P. J. O’Brien, “The role of ambient lighting in circadian disc shedding in the rod outer segment of the rat retina,” Invest. Ophthalmol. Vis. Sci. 19(11), 1257–1267 (1980). R. J. Mullen and M. M. LaVail, “Inherited retinal dystrophy: primary defect in pigment epithelium determined with experimental rat chimeras,” Science 192(4241), 799–801 (1976). S. Basinger, R. Hoffman, and M. Matthes, “Photoreceptor shedding is initiated by light in the frog retina,” Science 194(4269), 1074–1076 (1976). A. Krigel, M. P. Felder-Schmittbuhl, and D. Hicks, “Circadian-clock driven cone-like photoreceptor phagocytosis in the neural retina leucine zipper gene knockout mouse,” Mol. Vis. 16, 2873–2881 (2010). C. Bobu and D. Hicks, “Regulation of retinal photoreceptor phagocytosis in a diurnal mammal by circadian clocks and ambient lighting,” Invest. Ophthalmol. Vis. Sci. 50(7), 3495–3502 (2009). J. H. Immel and S. K. Fisher, “Cone photoreceptor shedding in the tree shrew (Tupaia belangerii),” Cell Tissue Res. 239(3), 667–675 (1985). G. W. Balkema and A. H. Bunt-Milam, “Cone outer segment shedding in the goldfish retina characterized with the 3H-fucose technique,” Invest. Ophthalmol. Vis. Sci. 23(3), 319–331 (1982). G. A. Tabor, S. K. Fisher, and D. H. Anderson, “Rod and cone disc shedding in light-entrained tree squirrels,” Exp. Eye Res. 30(5), 545–557 (1980). K. O. Long, S. K. Fisher, R. N. Fariss, and D. H. Anderson, “Disc shedding and autophagy in the cone-dominant ground squirrel retina,” Exp. Eye Res. 43(2), 193–205 (1986). L. Ruggiero, M. P. Connor, J. Chen, R. Langen, and S. C. Finnemann, “Diurnal, localized exposure of phosphatidylserine by rod outer segment tips in wild-type but not Itgb5-/- or Mfge8-/- mouse retina,” Proc. Natl. Acad. Sci. U.S.A. 109(21), 8145–8148 (2012). G. Staurenghi, S. Sadda, U. Chakravarthy, R. F. Spaide, and International Nomenclature for Optical Coherence Tomography (IN•OCT) Panel, “Proposed lexicon for anatomic landmarks in normal posterior segment spectral-domain optical coherence tomography: the IN•OCT consensus,” Ophthalmology 121(8), 1572–1578 (2014). de Jong, P. T. V. M.
Fig. 1 AO-OCT volume time-lapse traces reveal the optical signature of cone shedding, taken from one 90-minute session on subject #2 (see Visualization 1). (a) Retinal location of the two representative cones are highlighted in red and cyan in the cone mosaic en face projection at 3° temporal. The en face image is a registered and averaged stack of 31 cone image projections from which the representative cone time traces were extracted. (b) Cross-sectional and (c) averaged A-scan time traces are shown for the two representative cones over 90 minutes. Cross sections are 7 µm wide. The red-labeled trace shows the reflectance profile in which both IS/OS and COST reflections remain visible over the session duration. In contrast the cyan-labeled trace shows an abrupt loss of the COST reflection for 18 minutes (minutes 33 to 51) followed by its return, but axially displaced anteriorly. (d) and (e) quantify the OS shortening of the cyan-labeled cone after the 18 minutes loss of the COST reflection. (d) A-scan time trace is shown on a 3D perspective plot. The black and blue bars highlighted in (b) are the three contiguous time points that immediately precede and follow the temporary loss of the COST reflection, respectively. The average of these contiguous time points are plotted in (e). For this disc shedding event, the OS length decreased from 25.1 μm to 22.7 μm. Fig. 2 Temporary loss of the COST reflection varied in duration depending on cone. (top) Averaged A-scan traces of seven cones in the same 90-minute session depict the extent of the variation: < 3, 6, 12, 15, >18, >42, and 57 minutes. For the two cones labeled with asterisks, the loss of the COST reflection initiated or terminated outside the 90 minute duration of the session. (bottom) Histograms summarize the duration frequency of the loss in the COST reflection for cones in the three morning sessions. For loss durations that extended outside the 90-minute session, we counted the duration to be as long as the portion captured by the experiment, although the actual duration may be longer. Fig. 3 Temporary loss of the COST reflection was accompanied by a small decrease in the OS length. Histograms show the frequency of the length change for the three subjects in their morning sessions. For comparison, histologic cross section obtained on human depicts a shed disc packet at the OS posterior tip of a cone photoreceptor . Fig. 4 Spatial pattern of COST events during each 90-minute imaging session (morning, afternoon, and evening) for two subjects. The en face AO-OCT images are registered and averaged stacks of 31 cone images, one at each time point in the imaging session. Clarity of the cone mosaic substantiates the sub-cellular registration. Detected COST events are color coded and superimposed above the corresponding cone in the en face AO-OCT images: yellow (morning), green (afternoon) and magenta (evening). Note difference in scale bars for the two subjects. The bar plots show the percentage of tracked cones that were identified as undergoing a COST event during one of the three imaging sessions: morning, afternoon, and evening. Fig. 5 Spatial pattern of the 745 tracked cones and 175 detected COST events for the three 90-minute imaging sessions of Subject #3. (left) Tracked cones, common to all three sessions, are superimposed with yellow ‘ + ’ markers in the en face AO-OCT image. Cones that exhibited a single COST event are superimposed with solid circles color coded as yellow (morning), green (afternoon), and magenta (evening). The five cones that exhibited two COST events are superimposed with ‘ × ’ markers color coded as cyan (morning & afternoon), orange (morning & evening), and white (afternoon & evening). Fig. 6 Measurement precision of cone OS length changes as a function of time interval between measurements. Measurements were obtained on 26 non-shedding cones in the morning session of Subject #3. (left) Representative histogram of OS length change shows a Gaussian-like distribution centered about zero and with a standard deviation of 0.37 µm. Histogram is for a time interval of 9 minutes, selected because it approximates the average duration of the COST event (8.8 ± 13.4 minutes). (right) Standard deviation of OS length differences is plotted for all time intervals considered (0 to 72 minutes). Table 2 Image acquisition parameters.